Relieve fatigue with these purpose made mats and rolls. Anti fatigue mats for floors are primarily used for relieving body aches and pains through long standing operations in kitchens, manufacturing, packing etc. Anti fatigue mats can be manufactured in both rubber or PVC and are available in standard and bespoke sizes. 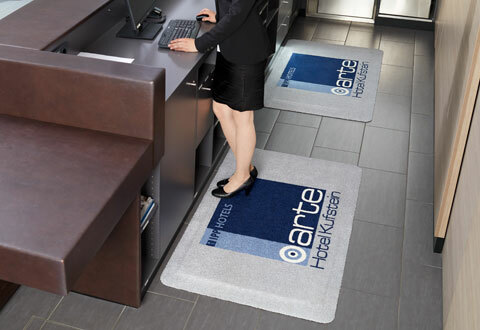 Comfy stand anti-fatigue mats reduce fatigue in long standing areas of work. With a highly durable foam base covered with a nylon fabric creating a stylish comfy mat. Easily vacuum clean and in an attractive range of colours to suit any decor give your staff the Surease treatment. With low profile edges and lay flat technology the Comfy Stand mat does not create a trip hazard in any environment. 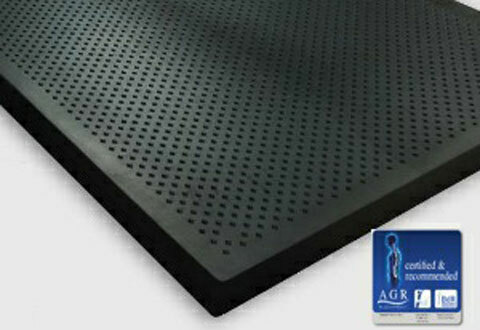 Comfy design anti-fatigue mats reduce fatigue in long standing areas of work. With a highly visual printed message not only offering muscle relief but performing a brand re-enforcement image as well. With a durable foam base covered with a very hard wearing nylon printed topping the shear versatility of this product cannot be underestimated in any environment. With low profile edges and lay flat technology the Comfy Design mat does not create a trip hazard in any environment. 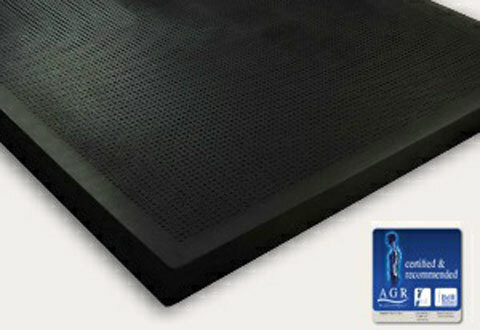 Comfy Safe anti-fatigue mats reduce fatigue in long standing areas of work. With a highly durable foam base covered with a very hard wearing nitrile rubber topping ideal in both commercial and industrial environments. Easily vacuum or simple mop with the yellow colour safety diminishing edge the perfect answer to relieving stress and muscle ache at work. With low profile edges and lay flat technology the comfy safe mat does not create a trip hazard in any environment. Flowthru drainage mats are perfect for indoor or outdoor use, where drainage is required along with excellent anti-fatigue properties. 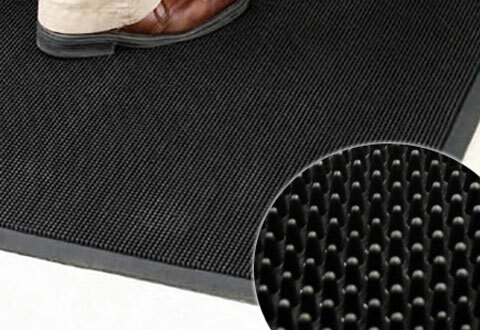 A durable and washable rubber mat with anti-fatigue and anti-microbial properties. The inorganic anti-microbial characteristics are built-in to inhibit the growth of bacteria, such as e-coli and staphylococcus aurous. 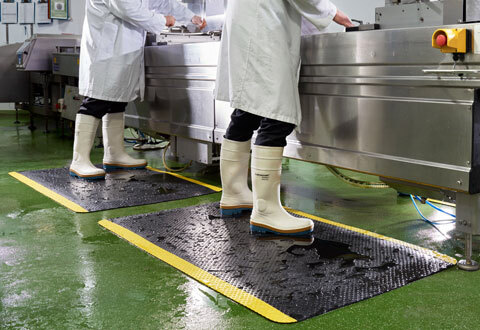 Flowthru drainage mats features a resilient nitrile rubber construction that eases the fatigue of long-standing jobs in the kitchen or a bar environment also helping to prevent impact breakage. A textured surface offers surefootedness and the thruflow holes contribute to drainage and cleanliness. Oil and grease resistant. 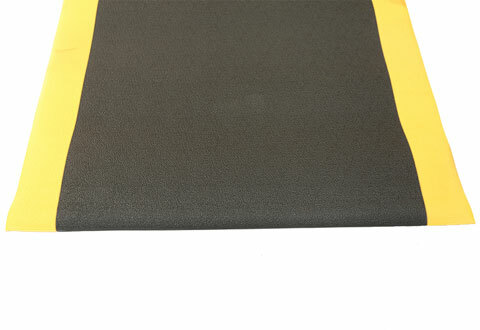 Worksafe mats are the popular rubber drainage free standing anti-fatigue work station kitchen mat. With a multi-directional anti-slip surface in a solid rubber pattern being ideal for traffic from any direction in confined areas. With holes for drainage and a bevel edge to all 4 sides they combine the properties of both anti-fatigue and anti-slip in 1 mat. So 2 mats for the price of 1. Perfect where constant water or any liquid is present as it easily flows under the mat to maintain a safe working environment. Available in 2 standard sizes in general purpose black rubber and kitchen oil & grease resistant red rubber. Chequer top roll matting is a heavy duty anti-fatigue floor matting with a heavy density foam base and solid PVC chequer plate patterned top. 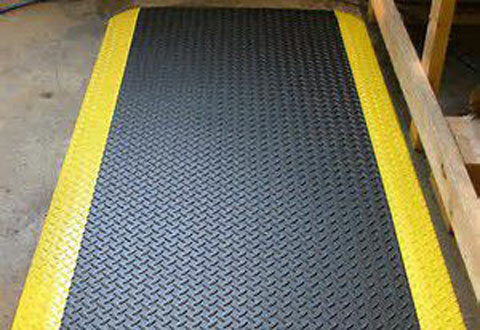 Black with yellow safety edges this matting is ideal as individual mats or in roll format, and is ideal in industrial and commercial environments where long standing operations are being carried out. Employees deserve to be comfortable whilst carrying out their duties and this anti-fatigue floor matting is ideal in relieving any aches and pains that can easily develop during some operations of non-movement during long periods. Giving excellent anti-fatigue properties to relieve tiredness and aches in the body due to the cushioning layer and a very hard wearing solid PVC anti-slip top surface which maintains the sponges durability. Available in 91cm width rolls x 18.3m in length - and can be custom cut to size with ramped edges to 2 sides. Softstep anti-fatigue matting is an anti-fatigue matting available in long rolls and cut floor mats. 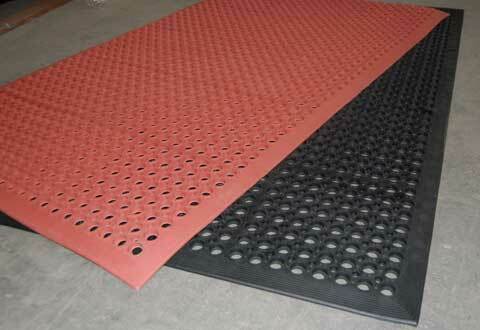 It is an excellent anti-fatigue PVC sponge cushion floor matting. Surease rolls or mats are ideal for reducing foot fatigue in long standing operations and against cold floor fatigue - it is only suitable for dry floor conditions. it is very comfortable and hard wearing floor matting perfect in packaging environments or where fatigue may play a part in carrying out everyday duties in a working environment. Available in 0.91m & 1.22m widths and 18.3m lengths in black with yellow bevel safety edges along the length of the roll. Can be custom cut to your requirements. Protek basic mats is an ergonomic mat that is ideal in areas where long standing operations are being carried out. Standing at service counters cashier points service desks all day will take its toll on an employees body but with the use of a properly designed ergonomic mat that toll can be significantly reduced. Available in mat sizes 135cm x 100cm x 16mm or in a puzzle cut interlocking tile format to cover larger areas - Protek Basic has it covered. Look after your employees with a Surease Protek mat and let them finish work as fresh as when they started. Protek oil / flame resist mats are ergonomic mats that are ideal in areas where long standing operations are being carried out. Working at a food preparation counter or production workstation, machine shop or packing line, this mat is the perfect solution. Oil resistant and flame retardant and available in the puzzle cut tile format it can be used to cover whole floor areas using either grey or black. 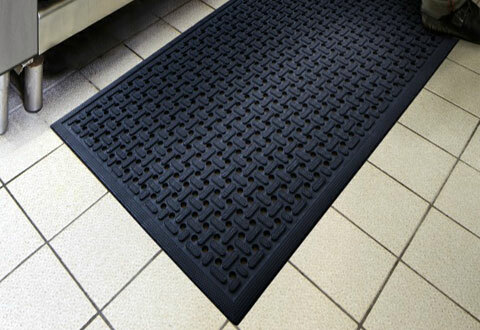 Comfytip anti-fatigue rubber mats are high quality natural rubber floor mats with thousands of tough, flexible rubber fingers which brush clean feet and collect dust, debris and moisture and trap it in the base of the door mat. Perfect for outside cabins on building sites to clean work boots or entry to any building from an outside area as these door mats are completely weatherproof. Integrally moulded bevelled safety edging as standard allowing excellent non-trip properties. Ideal as an outside floor mat as it is not affected by rain, snow, sun or other weather and is just shaken clean or washed with a hose and requires no further maintenance. Suretred finger tip rubber floor mats can also be used as an anti-fatigue stand-alone mat as the flexible rubber fingers massage your feet.